Chardonnay and Riesling together make up nearly 80 percent of white wine grapes harvested each year in Washington. 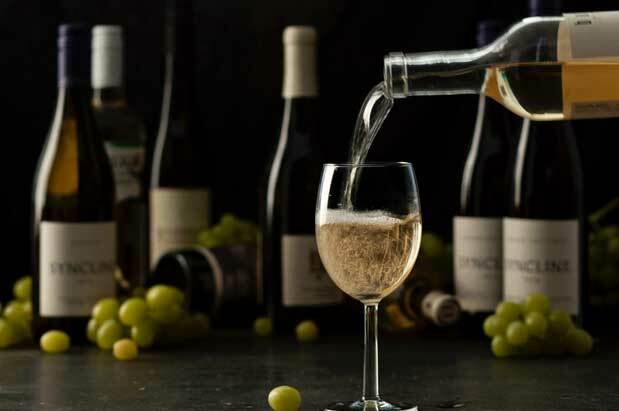 Include the next six varieties—Pinot Gris, Sauvignon Blanc, Gewürztraminer, Viognier, Chenin Blanc and Semillon—and the number rises to 98.7 percent. That leaves just 1.3 percent for the whole splendid mess of Earth’s other white grapes. (To put that into perspective: In a 400-page novel, 1.3 percent is only five pages.) But these miniscule margins are also the frontiers, where some of the most exciting wines in the state are being produced. Perhaps no winery is farther out on the frontier of white winemaking than Syncline Cellars. Run by husband-and-wife team James and Poppie Mantone in the impossibly beautiful, off-the-beaten-track town of Lyle in the Columbia Gorge, Syncline produces a range of red wines, a handful of sparkling wines and exactly three whites: a Grenache Blanc, a Grüner Veltliner and a Picpoul. What those three grapes share (other than their obscurity) is a potential for making bright, lively, food-friendly white wines. “Washington has a very generous climate,” says James Mantone, which is a gentle way of saying that much of eastern Washington is too darned hot to make compelling white wines, which thrive on cooler climates, keeping alcohols moderate and acidity bright and fresh. So Syncline sought out cooler vineyard sites. Beginning with the 2008 vintage, it made Washington’s first Grüner Veltliner, the fruit coming from Underwood Mountain Vineyards in the chilly Gorge. Soon after followed Grenache Blanc (2011) and Picpoul (2012) from Boushey Vineyard in a cool pocket of the Yakima Valley. Syncline is hardly the only Washington winery taking the road less traveled when it comes to white wines. These extended tasting notes reveal a cadre of Washington winemakers joyfully exploring lesser-known vinifera and offering a tremendous diversity of tasting experiences, if we know where to look. Woodinville winemaker Javier Alfonso believes it is up to winemakers to push the envelope of Washington viticulture. “I’m an aggressive poker player, so I’m always up for some experimenting and risk taking,” he explains. The native Spaniard placed his bets on Albariño, from Rias Baixas in Spain’s northwest corner on the Atlantic, and the results have been outstanding. “I love Albariño,” enthuses Alfonso, “for its ability to produce great, steely, high-acid, food-friendly wines: white wine for everyday drinking.” Bone-dry, ultra-vibrant, awash in lemon-lime fruit and mineral, this pulsates across the palate. PAIRING: Be a risk taker like Alfonso and try to make a tangerine beurre blanc at home to top the first halibut of the season. If the sauce fails, pour yourself an extra glass for the effort. Syncline is not the only winery to see the potential for Grüner in the Gorge. Leave it to RN74 lead sommelier and Woodinville-based W.T. Vintners winemaker Jeff Lindsay-Thorsen, who noticed that “the western Columbia Gorge’s cool, windy climate and its soils mirror Austria’s Kremstal region with deep loess, sandy loam and rock-laden soils.” The goal of W.T. Vintners is “to craft wines of place that have synergy with food,” notes Lindsay-Thorsen. W.T.’s version nails Grüner’s savory character, so unusual for white grapes, with lovely green pea vine and smoky/flinty notes to go with a core of lemony fruit. PAIRING: Grüner’s earthy greenness is just right for a warm French green lentil salad—maybe topped with a perfectly seared scallop or a paper-thin sheet of prosciutto. Roussanne is another Rhône Valley stalwart, and this particular Washington version by Woodinville winemaker Morgan Lee comes entirely from Olsen Estate Vineyard. The grape’s inherent richness—here in the form of peach preserves and marzipan—is well balanced by a sturdy mineral-acid spine, and there’s a terrifically appetizing green grace note, something like celery salt. PAIRING: A luscious crab bisque, best made with double the sherry called for in your recipe to bring out Roussanne’s wonderful nutty qualities. Mike Lempriere’s quest to grow Melon de Bourgogne (the grape of Muscadet in the western Loire Valley of France) on Bainbridge Island may be the most romantic, quixotic winegrowing venture in Washington. Lempriere fell in love with the “austere mineral quality [Melon] tends to express,” and he connected the climatic dots, noticing that the western Loire is “quite similar to our Puget Sound AVA: a cool maritime climate.” The vines were planted in 2004, and as they complete their first decade, they’re yielding wines with wonderful salty-mineral tang paired with austere, citrus-tinged fruit. PAIRING: Melon is all about subtlety, and so it goes well with oysters, that most subtle and salty of foods. To up your bivalve street cred, pair with an indigenous Olympia oyster. Raw, natch, and if you’re adding anything more than a few drops of freshly squeezed lemon juice, you’re blaspheming. Although the name of the wine doesn’t mention it, this is 100 percent Marsanne, a grape frequently bottled on its own in the northern Rhône Valley. It combines lovely layers of fruit—pear and melon, nectarine and lemon—with floral top notes and exotic spices such as cardamom. PAIRING: Sake no shioyaki (salt-grilled salmon). This simple, umami-soaked method is explained in mouthwatering detail in Dylan Tomine’s wonderful book of Northwest living and eating, Closer to the Ground. For salmon stripped to bare essentials, the traditional Pinot Noir pairing is inferior to a nice plump white like this Marsanne, which possesses both a perfect textural match for fatty salmon and a subtle flavor profile that allows the fish to remain the star of the show. The gobsmacking combination is springtime in the Puget Sound region at its very best.